As explained by Kevin Kelly during his ‘Project Lodge’ presentation at the NAFD 2018 AGM in Durham, reviews on Google provide valuable information about your business to people searching online. These business reviews appear next to your listing in Maps and can help your business stand out in Google search results. Reviews are only valuable when they are honest and unbiased, business owners shouldn’t offer incentives to customers in exchange for reviews however Google is happy for any business to encourage customers to spread the word about their business. The easy way to get all important star ratings from your customers is to include a prominent button on your website with a clear call to action i.e. ‘Review us on Google’. Once the button is in place you simply need to ask satisfied customers to visit your website, click on the button and leave you a review. Very soon you can start to benefit from 4 and 5 star reviews appearing in your business listing. Provide you with email, social media and telephone scripts to encourage reviews. People trust Google ratings, if your business is positioned at the top of search results and has good ratings you will cement your reputation with the online version of ‘word of mouth’. 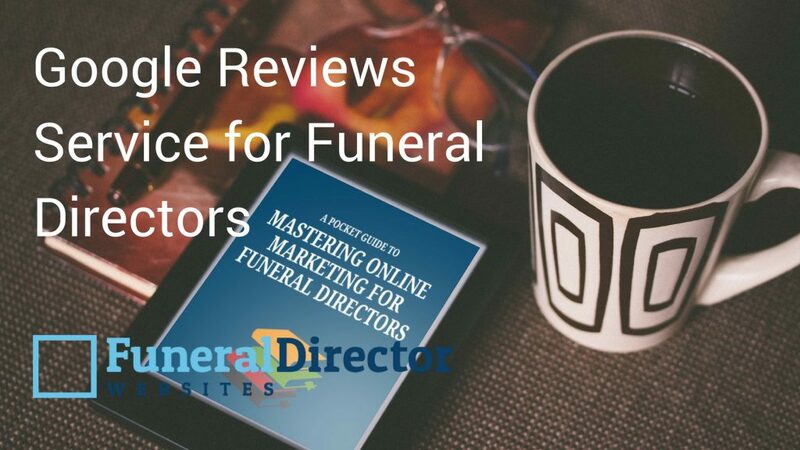 To find out more about Funeral Director Websites marketing services for funeral directors please contact Funeral Director Websites from our website or call us on 0191 242 4894/079 3864 7306.